The second Professor Layton game finishes off with a collection of absolutely sadistic puzzles, one of which involves sliding awkwardly-shaped pieces around a board to reach a goal square. Being the sort of person that I am, after I gave up on solving it myself, I wrote a solver to do it for me instead of looking up the solution on Google. 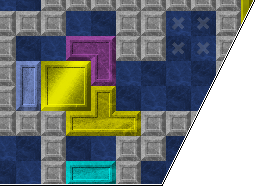 It was a few months later before I realized that in that solver, I had the perfect tool to create my own horrifically frustrating sliding puzzles - with no regard for difficulty curve, I threw them into the game as long as a computer could prove that they were physically possible. I wish you a happy time tearing your hair out.